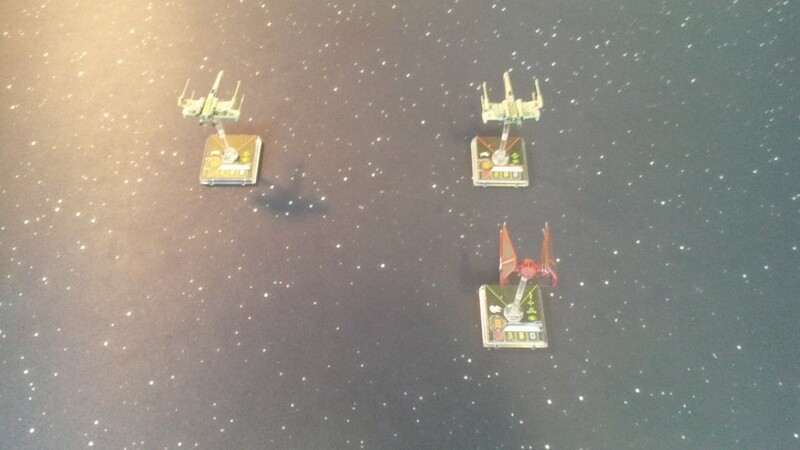 In 101 we learned that the Interceptor in this scenario has the X-Wing dead to rights. All the Interceptor needs to do is a 2 forward, land in the X-Wing’s old position, and it’s impossible for the X-Wing to get out of arc. 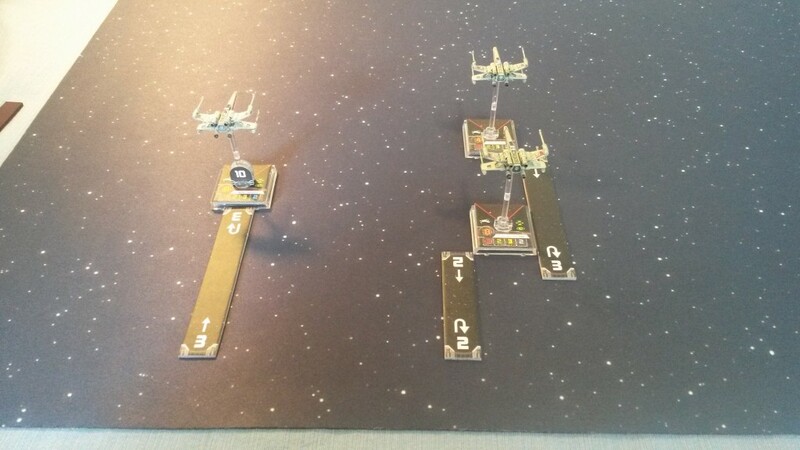 In 102 we saw that some ships do have options here, but for the X-Wing the only trick up his sleeve is the K-turn. 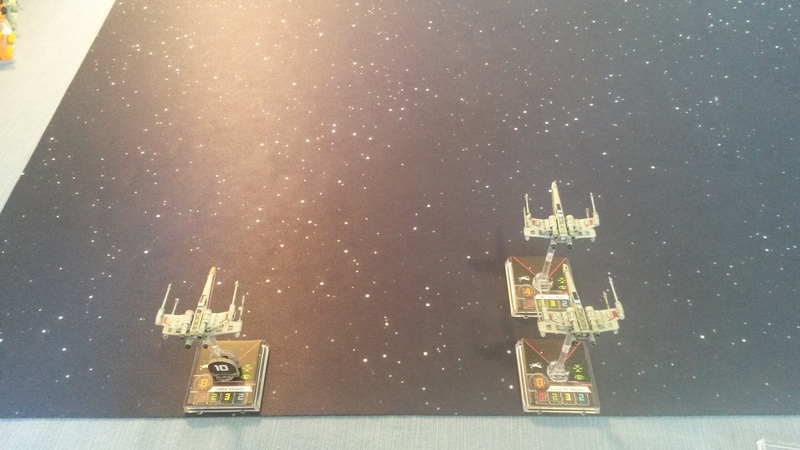 Our wingman X-Wing simply needs to do a 2 turn (while his buddy does a 4K) and they’ve both got arc on the Interceptor. 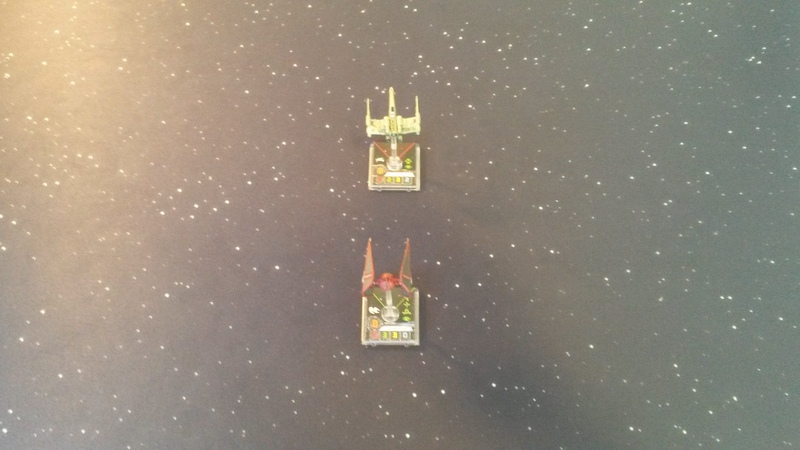 For the Interceptor to have avoided getting double shot, he would have needed to perform a hard turn to the left, followed by a boost, which would mean giving up his shots, possibly getting shot at by the lead X-Wing, and now having an X on his tail in the next round. The lead X also could have done a forward maneuver and taken a focus if he was very low on hit points. That gives the Interceptor a tougher choice of targets, and when the enemy changes targets you gain a huge advantage. When coming to your buddy’s rescue, it’s important not to get too aggressive. If the wingman X-Wing were to do a 3 turn instead, the Interceptor could barrel roll out of the wingman’s arc. It’s almost always better to sacrifice the chance at a Range 1 shot to have better odds at getting any shot. This is especially true when the enemy will get to shoot back with the same range bonus. Just kidding, it’s not common for people to fly 3 X-Wings at all! You do see tight formations with TIE Swarms and 4 B-Wing lists though. In those blocks, it’s hard for ships to act as wingmen. Instead, the block tends to function more like a single very powerful unit, and if one ship has a bad position it’s likely every ship in the squad is equally poorly off. 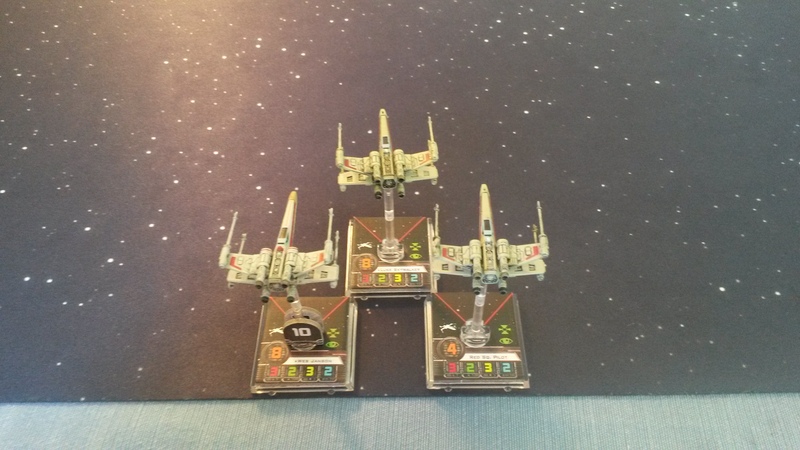 Instead, I like to fly a looser squad, like this one. The ships are still close enough together that they’ll be able to gang up on a single target, but the distance gives them some options for covering each other. To make the formation a little more dynamic, I’ll let the lead ship outpace the one behind him just a bit. 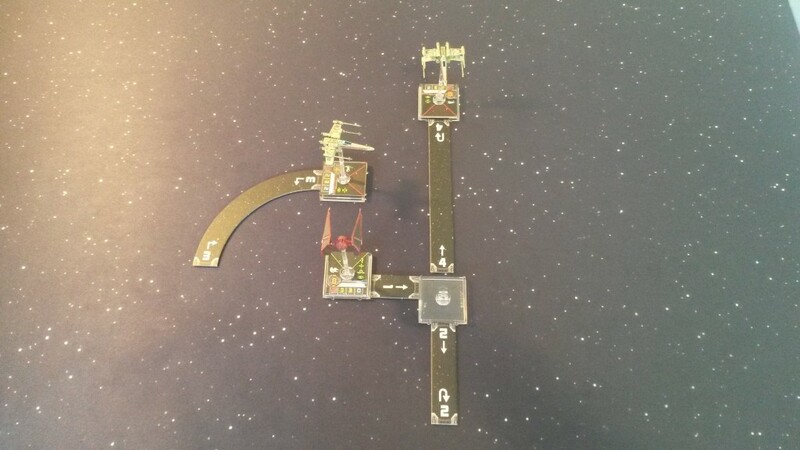 It’s now very hard for an arc dodger to slip past the entire squad, and in subsequent turns I can have the lead ship K-turn while the one behind him does a 1 forward and the guy off to the side banks, turns, or even K-turns. Of course, flying a loose squad does have some downsides. The biggest weakness is that the loner ship is often out of range in the first round of shooting. Against some squads, that’s okay, but against a swarm it can mean disaster. 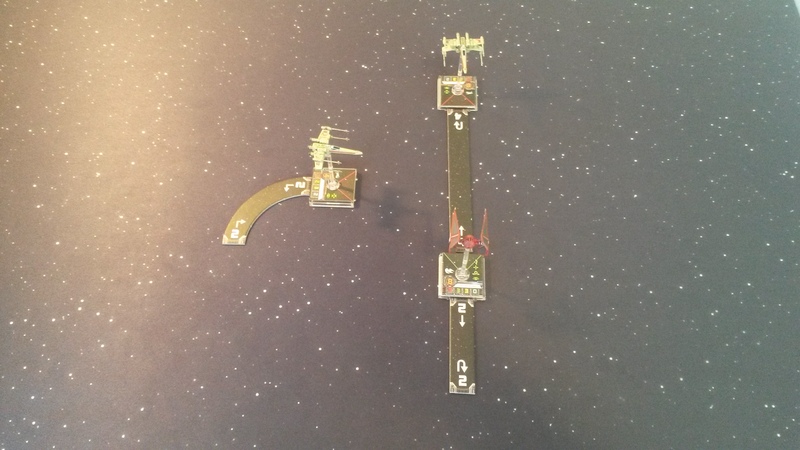 Remember to tailor your flying to the ships on the other side of the table. Loving these articles! Keep up the good work!